So I went to the Conservatory Garden in Central Park today to knit at lunch, because I suspected things had begun to bloom. 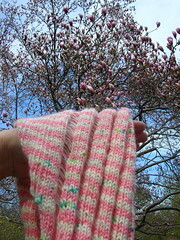 The pink on my needles was reminding me of pink tree blossoms. Was I right or what? The beginnings of the magnolia blooms were perfectly matched. There are cherry trees there as well, but those have not begun to bud yet. I'll keep my eyes open. Fortunately it was still a bit chilly today so there were only a few hardy garden lovers who witnessed me awkwardly holding up a scarf against a tree to take photos.